A current proposed federal law on GMO food would prevent States from passing their own GMO laws on labeling GMO foods. This past week, Scott Faber of the Environmental Working Group reported that Rep. Mike Pompeo's anti-GMO labeling bill, H.R. 1599, would also prevent companies from voluntarily labeling their products with non-GMO claims. Section 102 of Pompeo’s bill would make any non-GMO claim a violation of federal labeling law – unless the non-GMO claim was approved through a new certification program to be established by the U.S. Department of Agriculture. Under Pompeo’s bill, it could take the USDA at least a year, and more likely years to set up such a certification program. 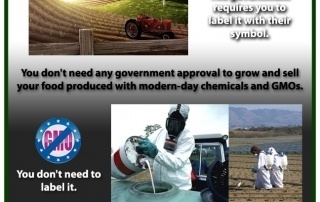 If you do not want the federal government forcing companies to stop voluntarily informing their consumers about whether or not their products have GMO ingredients in them, then urge your federal elected officials to oppose H.R. 1599 (and any Senate equivalent).